The River Cole at Coleshill is a tributary of the Thames and flows through National Trust owned farmland, North East of Swindon on the Oxfordshire and Wiltshire border. Background: The river has a long history of modifications and already the Domesday Book of 1086 has a record of a mill in Coleshill. 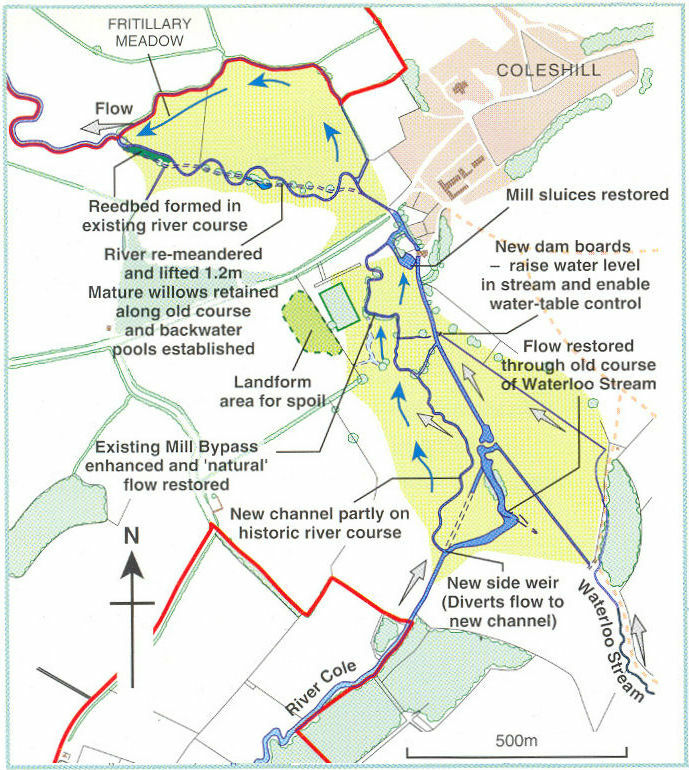 Until the late 1700s, the mill was fed by a small artificial channel carrying water from the Cole, but by 1818 the mill leat had been largely extended to take the entire flow of the Cole, and most of the old river course filled in. This type of historical management is typical of many other rural rivers in the United Kingdom. Until the Second World War the River Cole catchment was dominated by water meadows and pasture, but after the war much money and effort was put into drainage schemes for modernised intense arable farming. During a major land drainage scheme in the 1970s, the River Cole was deepened by about one metre between Coleshill and the Thames. Restoration: The wider aim was to promote river restoration and demonstrate how river restoration could provide multiple benefits such as enhancement in wildlife, landscape, fisheries, amenities and other local interests. The works was initiated in July 1995. The site consists of a 2.5 km long reach divided into two parts, upstream and downstream of the mill. Upstream of the mill the river was restored to its original course (retaining a small flow in the mill leat) to join the old surviving mill by-pass channel. This new smaller channel encourages beneficial flood storage on the fields and allows fish to pass the mill weir. Downstream the river was reduced in size and remeandered across the old course to a more natural profile, retaining existing mature riverside trees. The restoration of bed level, water level and flood regime was achieved by cutting the new meandering river at a much higher level, similar to that prior to the last major deepening scheme of the 1970s. All the techniques used can be found in the Manual of River Restoration Techniques. The River Skerne is a tributary of the River Tees in North East England. The restored reach lies in a sub-urban area on the outskirts of Darlington, County Durham. 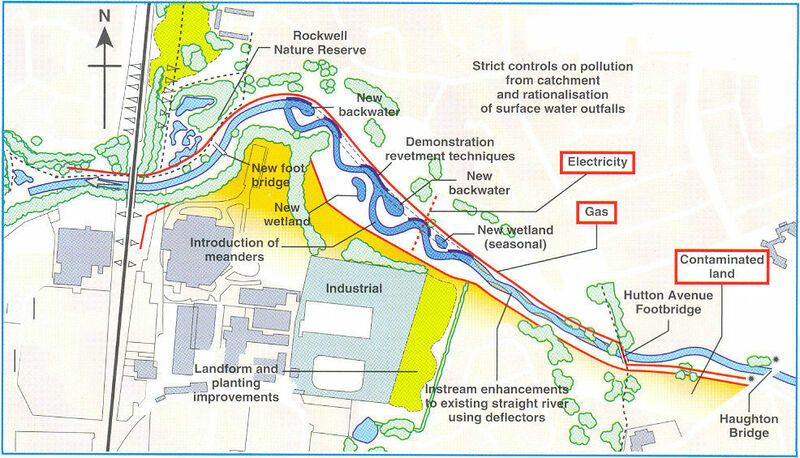 Background: During the last 150 years, the River Skerne has been heavily modified (channelised, widened and deepened) as a result of industrialisation and urbanisation. Much of the floodplain had been narrowed and raised by old industrial waste tipping, with gas and sewer pipes running alongside the river. As a result of these constraints, restoration opportunities were limited - typical of urban rivers elsewhere. Restoration: The wider aim was to promote river restoration and demonstrate how river restoration could provide multiple benefits such as enhancing aesthetics, recreational opportunities, wildlife, water quality other local interests. The restoration of 2 km of the Skerne was initiated in July 1995. At the upstream end, instream deflectors and a coarse sediment riffle were installed to enhance flow variability and habitat diversity. Further downstream four new meanders were cut across the old channel, which was used to create two backwaters. Soft revetments – such as willow mattress, willow spiling, underwater rock layer, fibre rolls, and geotextiles – were used on the outer meander bends to prevent erosion towards the gas main. As a flood water retention measure, about 25,000 m3 of spoil was removed from the river banks. The spoil was later used for landscaping purposes. Misconnections were corrected and surface water outfalls replaced with underground collection chambers. New footpaths and a footbridge were constructed and a planting scheme engaging local residents was carried out. All the techniques used can be found in the Manual of River Restoration Techniques. 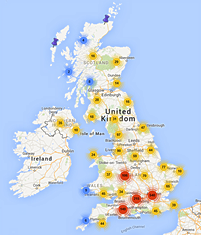 Click here for a list of publications on the River Cole and River Skerne projects.